Heartburn, otherwise known as acid reflux or gastro-oesophageal reflux disease (GORD), occurs when the acid in your stomach passes back up your oesophagus (that's your food tube or gullet). Heartburn is a burning sensation in the chest that is most noticeable at the lower end of the breast bone and moves upwards towards the throat. 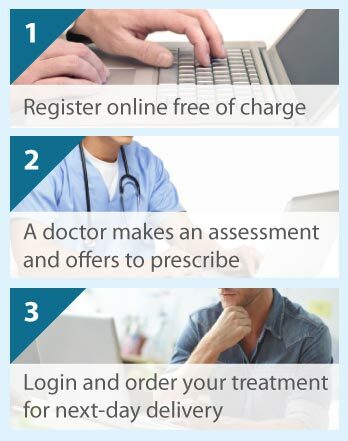 The Online Clinic can prescribe a range of treatments for heartburn. Please complete an online consultation form and we will recommend a range of appropriate treatments. The stomach produces a strong acid to help you digest your food and drink. At the point where the oesophagus and stomach meet, there is a ring of muscle called a sphincter that acts as a one-way valve. Normally, this valve relaxes (opens) to allow food and drink into the stomach and closes (contracts) again afterwards, preventing the stomach acid and other stomach contents from passing back up into the oesophagus. If the sphincter does not work properly, acid flows back out of the stomach and into the oesophagus. This irritates the oesophagus, resulting in a burning sensation in the chest. Who is at risk of heartburn? Most people get heartburn at some time, and its cause is not always known. Some people who have a healthy lifestyle and no obvious risk factors may suffer from the condition, while for others there may be a more obvious reason for the cause. Heartburn is often associated with eating large meals (particularly those containing a lot of fatty foods) or drinking a lot of fluid (especially alcohol), and with smoking. Heartburn may occur when there is pressure on the stomach, such as in people who are overweight or in women who are pregnant. Bending over or lying down, some medical conditions (e.g. hiatus hernia), and various medicines (e.g. steroids, and those used to treat heart and blood vessel conditions and thin bones) may also increase your risk of heartburn. How can I reduce the risk of heartburn? Considering the risk factors that can lead to heartburn, many people find that lifestyle changes alleviate the pain and discomfort. For example, reducing the size of your meals, especially fatty meals eaten late in the evening, drinking alcohol responsibly, losing weight if you are overweight, and stopping smoking. You should also try to wear loose clothing, avoid bending forward, and prop yourself up in bed. For most people, heartburn causes discomfort only. However, if you suddenly start to get heartburn, or it occurs frequently or is persistent, then it may develop into something more serious. Stomach acid can cause inflammation of the oesophagus (also called oesophagitis), which at worst can lead to ulcers and bleeding, or difficulty in swallowing. If you suddenly start to get heartburn, or it occurs repeatedly or continuously, or you are concerned, then visit your doctor. If you have symptoms that are mild and tolerable, your doctor may suggest you follow the above advice about lifestyle changes. However, if your symptoms are bothersome, medicines for heartburn can either be bought over the counter at your chemists or prescribed by your doctor. Not all people can take all heartburn medicines due to other medical conditions or medicines that they are taking. Moreover, some people need only to take heartburn medicines occasionally when their symptoms return, while others may need them more regularly. Your doctor will advise you which medicine is most suitable for you and when you should take it. Your doctor may prescribe a medicine called an antacid that neutralises the acid in your stomach. Some antacids also contain a product that lines the oesophagus with a protective coating or produces a layer on top of the stomach contents preventing the acid from flowing back into the oesophagus. Medicines known as H2 receptor antagonists, such as ranitidine, and proton pump inhibitors, such as omeprazole, are also commonly used to treat heartburn. These work by reducing the amount of acid produced by the stomach. Some medicines may also stimulate the muscles of the oesophagus and stomach, helping the food to move out of the stomach and into the intestines.